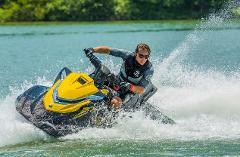 Enjoy an unguided jet ski rental for 4 hours of fun in the sun. Anchors provided for sand bar hopping. We offer 3 seater jet ski rentals for an hour and up. 1 hour is your basic quick fix to fun. It goes by very fast but does the trick. If the 1 hour does not work we offer various times for rentals as well. We offer 3 seater jet ski rentals for an hour and up. 1 hour is your basic quick fix to fun. It goes by very fast but does the trick.